An image from the Replay menu in Brawl. An image from the Replay menu in Super Smash Bros. for Wii U. The crossed-out replays have been invalidated by updates. An image from the Replay menu in Ultimate. Replay is a feature in Super Smash Bros. Brawl, Super Smash Bros. 4, and Super Smash Bros. Ultimate that allows players to view previously saved matches. Replays were introduced with Brawl. When a match concluded, players could press the Z button, or the B button on a lone Wii Remote, to save a replay onto either the Wii or an SD card. Replays can only be saved if the match lasted less than 3 minutes, Sudden Death included. The reason for this limit is unknown, as a number of hacks can remove this limit; even with such hacks, however, replays over 10 minutes do not function properly, as replays stop saving inputs beyond the 10 minute mark. When saved, replays will be named rp_YYMMDD_hhmm.bin, where YY, MM, DD, hh and mm indicate the year, month, day, hours, and minutes, respectively, when the replay was saved. If saved onto an SD card, they will be stored inside app\RSBX\rp, where X is J, E, or P depending on the game's region. The number of replays that can be saved depends on the free space remaining on either the Wii or the SD card. 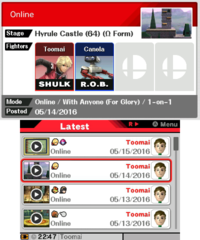 Replays returned for both versions of Smash 4, with players instead pressing Y on the third page of the results screen. The time limit for replays was expanded to about ten minutes, allowing for greater freedom in what replays can be saved. However, a hard cap was enacted for how many replays can be saved; only 64 can be saved in the 3DS version, and the Wii U version allows well over 200. Replays could no longer be saved after a No Contest. When viewing replays, the player can pause the game normally while viewing a replay, allowing for players to take snapshots of the game. The camera can also be controlled even when the replay is not paused, using controls identical to the games' built-in camera modes. Alongside custom stages and snapshots, players could potentially send replay data to other players they had registered as Friends on their Wii. Players were allotted 20 points per day to send Vault data with, with larger items requiring more points. As replay data could be saved to SD cards, it was also possible to share replays with others by transferring the data onto another console. Prior to June 30, 2009, players could send their Brawl replays to be used for the Smash Service; after June 30, no more replays, custom stages, or screenshots would be accepted, and one month later, on August 1, replay data was no longer being sent. Replays used for Smash Service were all from Stadium mode, especially Home-Run Contest and Target Smash! !, due to their shorter length and file size. In both versions of Super Smash Bros. 4, Share mode allows players to upload replays to the official servers. Shared replays can be made visible to the public or only to users on the player's Friend List. Viewers can also download shared replays to their own console. As with other shared data, replays will be deleted from the server after 30 days. In Super Smash Bros. for Wii U from version 1.1.0 onward, players could choose to upload their replays to YouTube. This could only be done with replays of less than about 3 minutes and 14 seconds in length. The replay would be played back for recording before the upload began; if the player manipulated the camera during playback, the resulting YouTube video would be affected accordingly. The player could enter a title for their YouTube video, while the description field on the site was automatically populated with the game mode, stage and characters used. The video was uploaded with a resolution of 720p. The current game version number was displayed at the beginning of the video. The player would also have to make a Miiverse post with a comment or drawing of their choice. This post would appear in the Replay Viewing Community, with the video embedded. Beginning in version 1.1.1, players could upload an automatically edited "highlight" version of a replay instead of a full length version, similar to the Mario Kart TV videos in Mario Kart 8. The highlight function reduced a replay to a series of short clips totaling between 30 and 60 seconds, regardless of the original length. It generally favored showing KOs from high-knockback moves, and also tended to include Final Smashes even if they do not KO. The first and last few seconds of the match were always included, though the starting countdown was omitted. Using this function on the same replay multiple time could result in different highlights being selected. As of November 8, 2017, replays and highlight reels can no longer be uploaded to YouTube due to the discontinuation of the Miiverse service. In Super Smash Bros. Ultimate, replays can be converted to video files, which will be saved to the Nintendo Switch system's SD card under Nintendo/Album/Extra. When converting a replay, the user can choose whether to hide display elements like the damage meters, whether to mute the background music and/or sound effects, and whether to use high or normal video quality. Rendered videos can be transferred to a PC and manually uploaded to YouTube or another site. The maximum video/replay duration is likely 15-? minutes. The only time a replay won't be allowed to be saved after a match is when a glitch is used to make irregular movement, causing false movement calculations (Is when the player uses the frame by frame option) or if the match is terminated early. The format for both of these exports are always MP4s at 1280x738+60FPS (1280x720 display) while using the video codec H264 - MPEG-4 AVC (part 10) (avc1), decoded as Planar 4:2:0 YUV and languages are dependent on game language. The audio sample rate is 48000HZ while using Stereo audio channels, the codec for audio is always MPEG AAC Audio (mp4a) and languages are dependent on game language. Contrary to what may be expected, a replay is not saved as a video recording of the match. Instead, the input data from the match, the match's random number seed and the general rules are saved, so when a replay is watched, the game actually regenerates the match from the data. This makes replays much smaller in file size than a video file, and it also allows for pausing and camera movement during the replay. Replays do not save the players' names, but this can be changed with some hacks. For online battles, the game saves each player's server number and client number. When a player battles online, the player is seen as player 1 on his screen (client), but that may not be true for the server. In saved replays, each player's color and the numbers above the characters' heads indicate the client numbers (the ones that were seen on the screen of the one who saved the replay), whereas the order in which the character portraits appear on the bottom indicate the server numbers. While playing with default settings or online in With Anyone mode, the characters' scores will not appear on the screen. However, when battles are saved as replays, the replays will show the score numbers above the characters' icons as if playing with the Score Display setting turned on. In both Brawl and Smash 4, replays do not save the input data from CPU players; instead, each CPU player simply replays the match from scratch. The discovery of this discredited a rumour that the AI was capable of learning, as if this were possible, any replay involving CPUs would desync without having stored each CPU's "learning state". Taunt messages are not shown in replays. Because replays in Brawl and Smash 4 record inputs rather than a video of the match, it is possible for replay contents to differ from the original match when played back. If a character or other element is loaded during a match faster than expected (such as because of pausing or online lag), then the replay of that match will "freeze" and finish loading the element before it can continue. A common error noted in replays is that they may "desync" over time; the effects vary, though among the most common are actions occurring that did not previously occur, excessive lag followed by significantly increased playback speed, and the replay abruptly ending. With the Pokémon Trainer, particularly unusual effects can occur, such as him sending out a Pokémon which never loads or leaves the revival platform. Replays of Wi-Fi matches are more likely to desync than local matches due to the frequent lag experienced in games, but local replays can also be subject to the problem. The cause of "desyncs" is unknown, though it is speculated it has to do with save data of replays becoming corrupted by some outside factor. In addition, it is possible for a replay that plays fine to randomly desynchronize when played again, and after some tries, play correctly again. Some Special Brawl modifiers can also be responsible for desyncs, as some modifiers like Curry and Speed directly affect the speeds of characters and other actions. Gameplay mods can also cause desyncs to occur, as many mods modify the characteristics of combatants, thus preventing the saved match from properly running. For similar reasons, Smash 4 warns players after they save their first replay that updates to the game can potentially cause replays from older revisions of the game to no longer function; furthermore, all updates that adjust game balance prevent the playing of older replays and provide an option to mass-delete them. When uploading a replay to YouTube, there is a small chance that, at some point during the process of converting the replay into a video, the music will suddenly stop playing for a few seconds. If this happens, the game will erroneously state that the post was cancelled. Additionally, posting the video disables the ability to post screenshots on Miiverse or take screenshots using the Wii U's Image Share feature. In order to post screenshots online again, players have to restart the game. The replay menu in SSB4-3DS, in which a bug results in R.O.B. 's head icon not being displayed on the bottom screen. A very rare bug causes saved replays to have idiosyncratic values in its timestamp, such as 781/88/2008 280:-480. A rare bug in the 3DS version results in R.O.B. not being listed with a character head icon correctly; it is unclear what causes this. In Super Smash Bros. for Wii U, when organizing replays "By Stage", Mario Galaxy replays may be located after Delfino Plaza replays, despite Mario Galaxy being before Delfino Plaza on the stage selection screen. Ultimate's Video menu has a hidden sorting menu. Aside from being hidden, it is similar to the sorting option menus in other menus in the game (including the Replay Data menu). The likely reason for it being hidden is due to it only having one option: By Date. If the player uses the frame-by-frame advancement in the middle of a match in Ultimate, the replay will become impossible to save. This page was last edited on April 16, 2019, at 12:10.